I am so honored to be sharing my favorite room with you all here on Savvy Southern Style. Thank you so much, Kim, for asking me! I have really enjoyed this series and I am so thrilled to be a part of it! I would have to say my dining room is my favorite room in our home. When we moved into our town home several years ago it was one of the first rooms I started working on. We had moved from an older home (I am a HUGE fan of older homes) in another state and I had a bit of a hard time adjusting to the new construction and more modern layout that lacked warmth. To help add character to the dining room and help define it (it is part of one long large room that includes our living room) we first added some beadboard and then wallpapered above it. After that we added the oversized candlelit chandelier. Once that was done it was easy to start adding in our furniture. To start with we just used pieces from our last home. This fall I decided to attempt my first building project and built our farmhouse table. I had so much fun that I ended up making a bench to go with it. 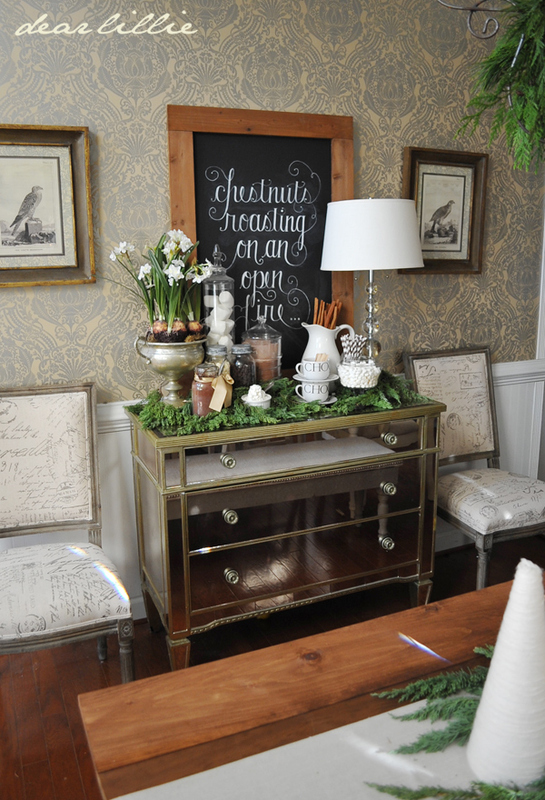 And then after that I made the oversized rustic chalkboard that you can see on the mirrored chest. I think the thing I like about this room the most is it's versatility. The wallpaper and chandelier are a bit bold but because everything is done in neutral colors it allows me to change things up in here quite frequently and give it a different look and feel by switching out the accessories. Thank you all for letting me show you my favorite room! And thank you so much, Kim for having me! Jennifer, thanks so much for sharing your beautiful favorite room. I know this is a super busy time for you. Most of y'all probably already read Dear Lillie, but if not you are in for a treat so get comfy and go check out her blog and she also has a shop filled with cute things. Gorgeous! 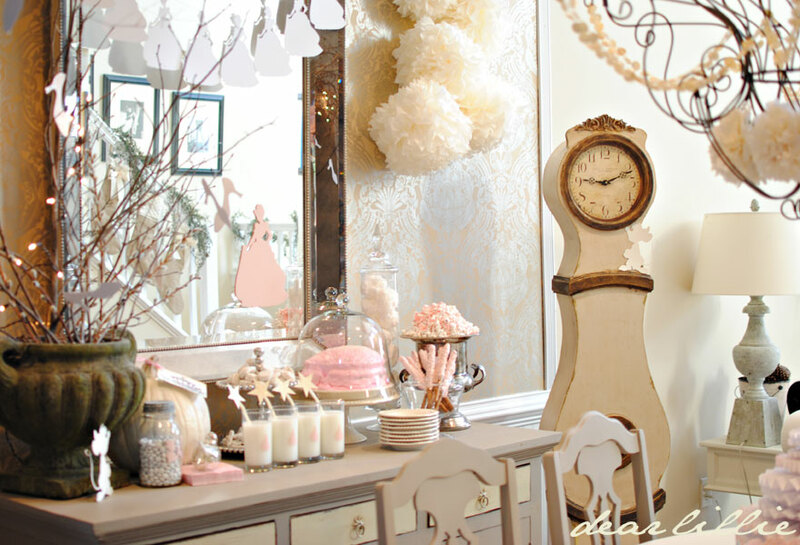 Thanks so much for sharing this absolutely fabulous room! What a gorgeous room. I love al of the Christmas details added for the season. Stunning! Thanks for sharing. Beautiful home! I enjoyed her Christmas tour too!I agree older homes have so much more charm.We live in a newer home too.Maybe someday I will get my farmhouse. 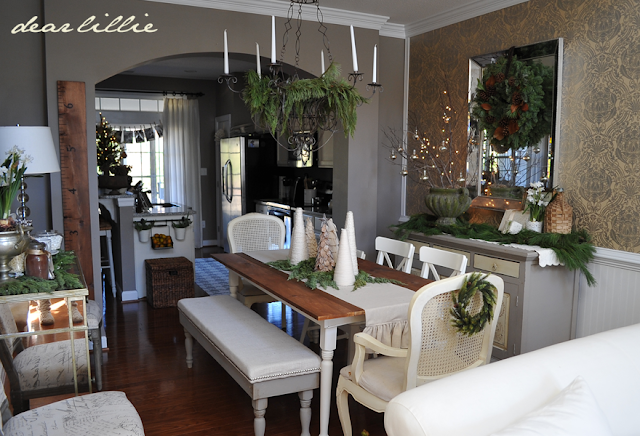 Thanks for sharing Dear Lillie's beautiful home and blog Kim! Have a great weekend! Gorgeous dining room!!!! I love all the different ways Jennifer decorated it. Such a beautiful dining room Jennifer has! Thanks for sharing it with us! 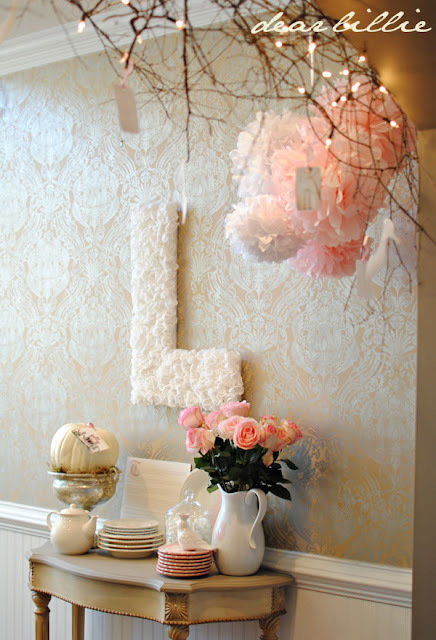 Dear Lillie is one of my favorite blogs! I always enjoy seeing what new item she has made and how she decorates her home for all the holidays. So pretty and such great photography! Love her dining room. 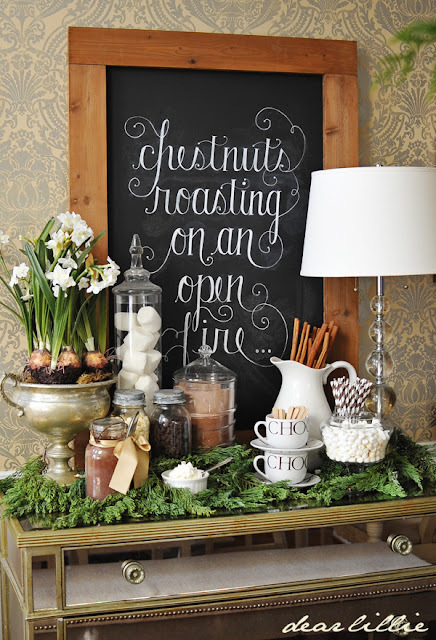 Wish I could write like that on my chalkboards! Amazing! Thanks for sharing this today. I just love everything about Jennifer's lovely home and decor. Her little girlies are precious, too! Oh my, how beautiful! She has a very unique and fabulous style! What a beautiful dining room! How fun to see it decorated through out the year! 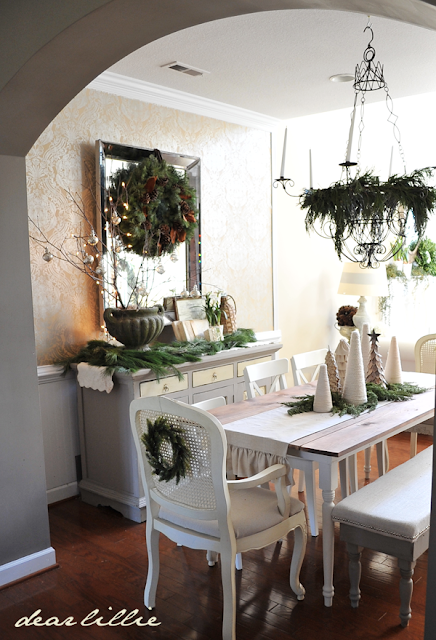 I adore Jennifer's home, and her dining room is no exception! Kim, I love Jennifer's dining room. 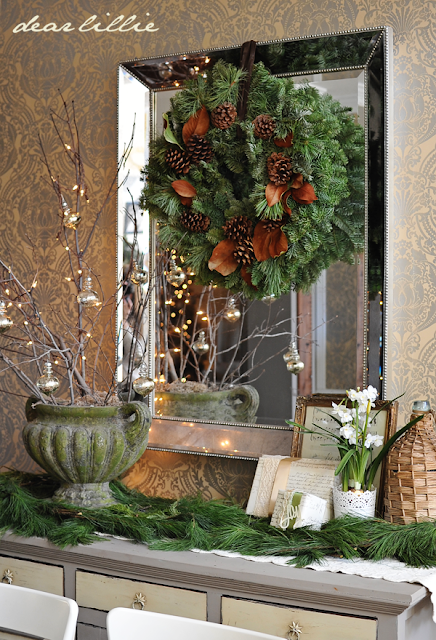 That wallpaper is a gorgeous foil for all her pretty decorations, no matter what the season! 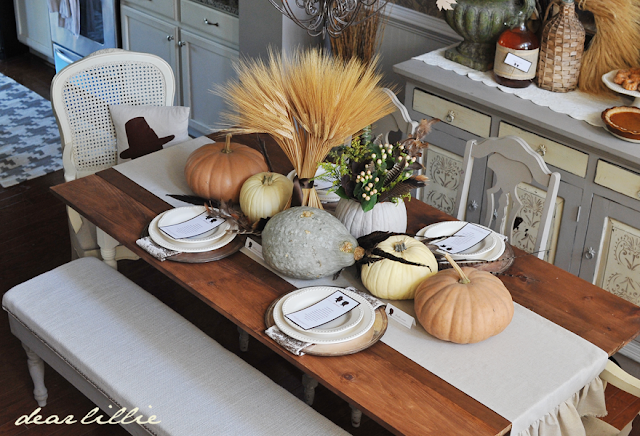 What a beautiful job decorating for all the occasions and I just love the table you've made. always gorgeous at Jenni's house! great feature!! Stunning wallpaper, it totally makes it! Lovely room and I am impressed with the table! 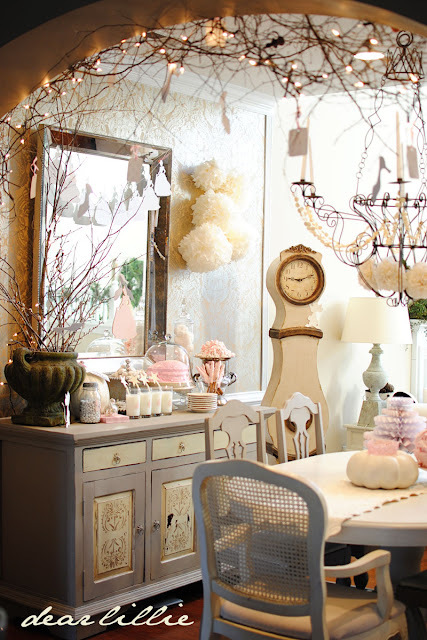 Such a gorgeous room - and a gorgeous blog! What a beautiful dining room! 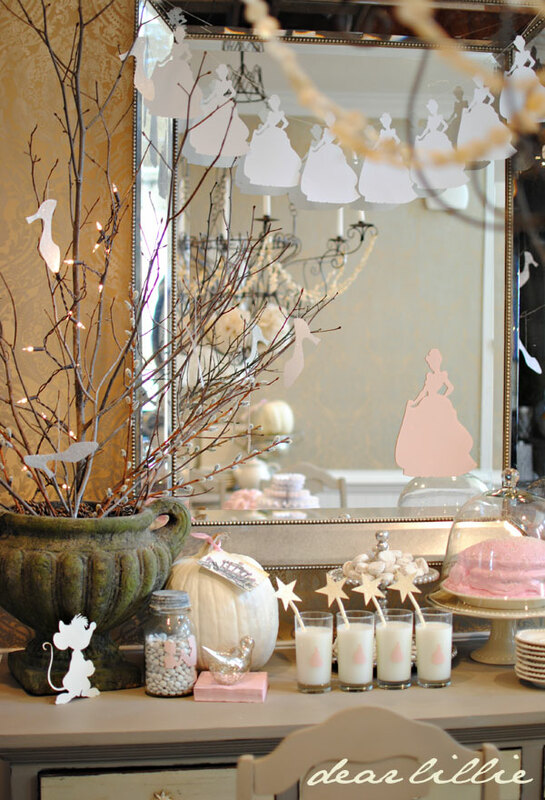 Love the fixture over her table, stunning. Just lovely! 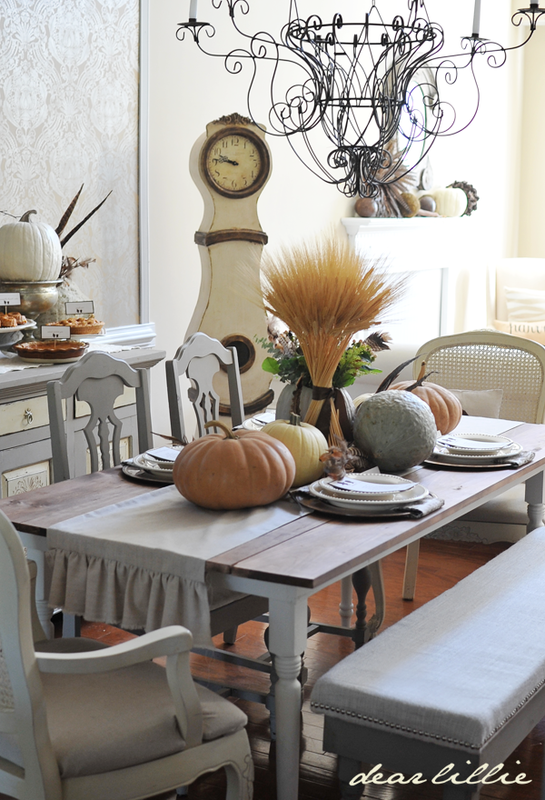 Jennifer's dining room is one of my favorites... 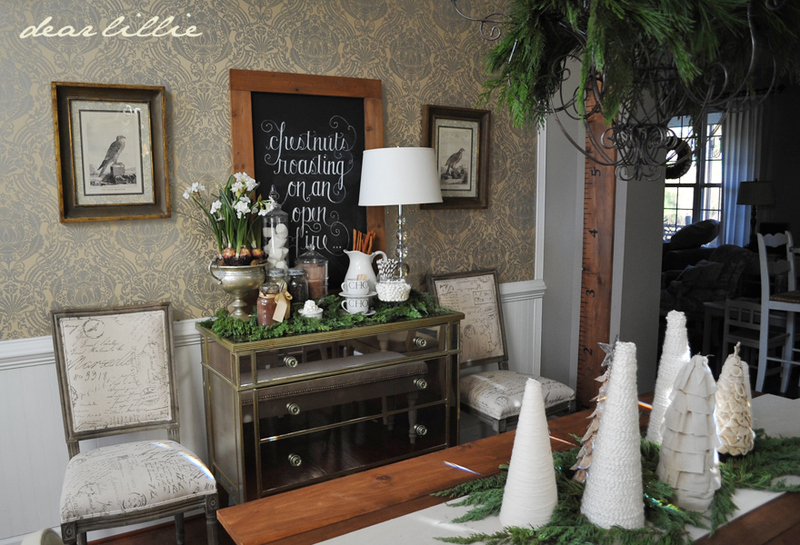 I love seeing it decorated each season and I'm really loving the recent addition of a couple wood pieces. It's beautiful! I love your dining room too Lillie! So fun for you to be featured over here at Kim's! Great pick Kim!! Gorgeous...I love the way it is transferred every season...just beautiful! I love everything about Jennifer's beautiful home! 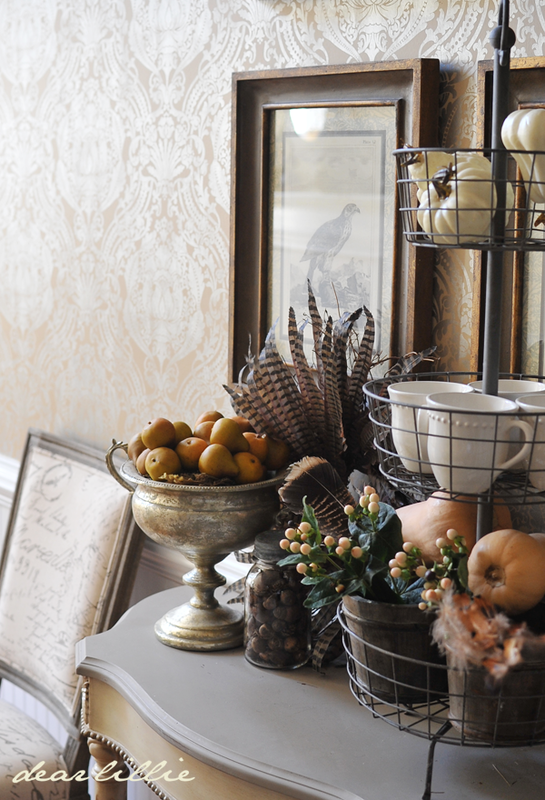 Her dining room has always been a favorite of mine!! Great feature Kim! 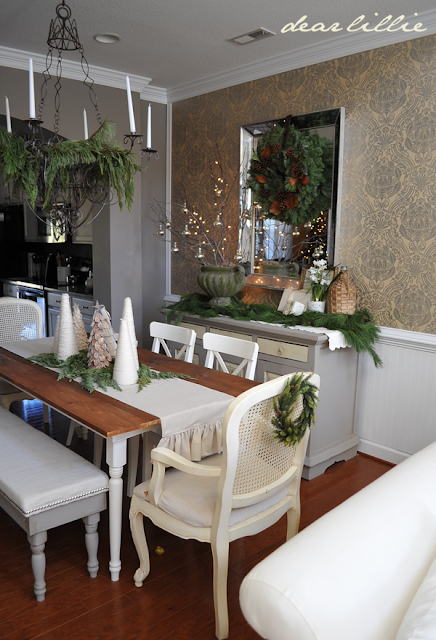 Jennifer...your dining room is gorgeous as the rest of your home!! !...I just love your chalkboard art...magnificent! Wow, what a beautiful room and I am so amazed at the furniture making. Such a pretty room. I loved seeing the different decorations for each season. No wonder it's your favorite room! Each look is lovely. I am so impressed when someone makes the furniture! You've done a beautiful job!! The wallpaper and the chandelier look perfect. The room is very inviting and warm.